I decided for now I will write more detailed session reports of the Pathfinder Adventure Path I am currently GMing. We’re playing Rise of the Runelords. If you play this AP or plan to play it, I warn you, there will be spoilers. 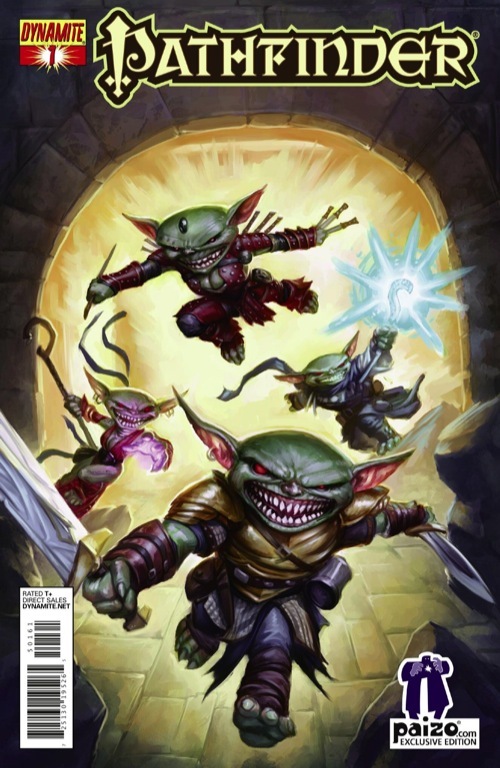 Rise of the Runelords is a sweeping Adventure Path that begins with a harmless goblin raid on the small town of Sandpoint. Session 1: the heroes came to Sandpoint, participated in the Swallowtail Festival, found out that one of the festival games was a total sham, and then defended the town when the goblins raided it. They saved Lord Aldern Foxglove, who took a shine to Calandria. Session 2: Where heroes go to die. The heroes decided to be contrary, did not really want to cooperate with the sheriff of the town when he asked their help, but then later found out that a body was stolen from a town crypt during the raid, and unwillingly went on a hunt with Lord Aldern Foxglove when they tried to find more goblin tracks. Session 3: Suspicious that a boar in the Tickwood had lots of ticks (duh! ), our heroes investigated the woods and found a monstrous mother tick breeding, right next to a small shrine of Lamashtu, goddess of monsters. Back in town, they convinced the mayor to increase their payout for assisting the town, got roaring drunk in celebration, witnessed a family fight in the inn between the innkeep Ameiko and her father Lonjiku and in the morning found out the owner of the inn went missing. We begin our session with the party trying to figure out what they’ll do. As a letter hinted at a meeting in the Glassworks in town, with Ameiko and her brother Tsuto, that’s where the party headed. The barbarian tried to climb onto the roof, without much success whereas the rogue casually picked the door to the main shop. The party advanced very carefully, and two doors later peeked into the furnace room where goblins were obviously having fun. The party then surprised me by simply moving off and investigating every other room in the building. I mean it, every single room. Even the stairs outside to the beach. I made hidden checks to see if goblins would wander out and catch them, but no, they got all the time in the world to check out every single room, including the latrines. When they wandered to the stairs to the basement, I tried to lure them back to the furnace by having the goblins playing soccer with the chopped off head of one of the Glassworks employees. They noticed the head and that the goblins were playing, and I hoped that either the barbarian or the paladin would be enraged by this to storm the furnace room, but nope. The barbarian got the job to guard the door, and the others went downstairs. In the basement, they soon found the door to the office where Tsuto Kaijitsu, the innkeeper’s half-brother and organizer of the goblin raid, was sleeping off a hangover. Just about when they tried to open the door, Tsuto walked out, spotted them, and started running with a successful Acrobatics check. Now, logically, he should have fled and escaped through the smuggler tunnel under the Glassworks. But to make things more exciting, I had him run upstairs where he made another successful Acrobatics check to roll through the legs of the barbarian in the doorway. He was pissed, let me tell you. Of course, he never got to join the goblins in the furnace room, as the barbarian managed to trip Tsuto, and two more PCs piled up on top to tie him up. Tsuto did manage to alert the goblins, who started to rush out of the furnace room throwing glass and shooting arrows, into their certain death. 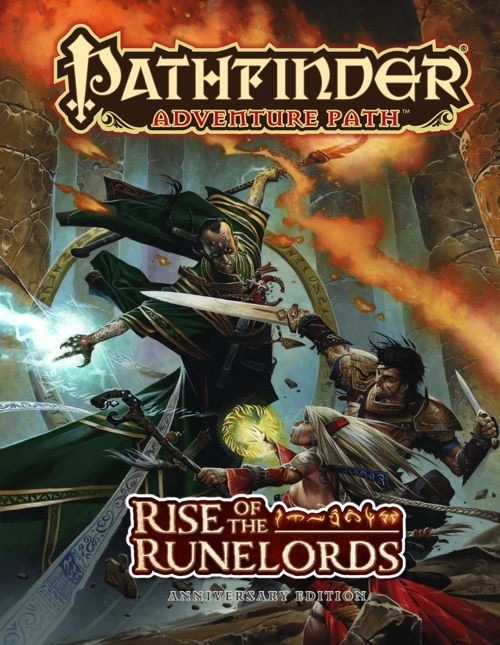 Rise of the Runelords is written for 4 PCs, and the advancement track suggests that they do not level to 2 until they’re done with the Glassworks. But as I had added additional encounters and did almost all the encounters of the Local Heroes section, most of them were level 2 already. The original Glassworks encounter would have been 6 CR 1/3 goblins plus Tsuto, a level 2 monk/2 rogue. Instead, I made them face 9 CR 1/3 goblins plus 2 CR 3 goblin warriors from the Monster Codex (which I really enjoy). The raging barbarian got fairly low health-wise because the arrows of the goblin warriors packed a punch, but everyone else did really well. For fun and giggles, our sorcerer did not remember that Color Spray is a cone effect, and effectively managed to stun and blind the barbarian for 8 rounds. It was a long battle that took us forever to resolve, but with Tsuto out of the question, the goblins were soon running out the other side of the furnace room, to be butchered. It was only then the party took the time to actively check out the furnace room, to find out that Tsuto had encased his ‘father’ in molten glass, and that the goblins had been having fun with the remains of the workers, chopping them up, trying to cover them in glass as well or simply burn them. The party managed to search Tsuto thoroughly and intimidated him sufficiently that he spilled the beans why he killed his father and tried to abduct his sister Ameiko. He also told them about his lover Nualia and Thistletop, though very little. The party went to free the badly beaten up Ameiko from the basement, and then investigated the smuggler tunnel a bit, while the gnome ranger stayed behind with Ameiko. They found the entrance to the catacombs, and that’s when we made our cut as it had gotten very late. As most of my players are co-workers, I know the next session will be tricky. For one, they aren’t sure what to do with Tsuto. At least one character does not want to give him up to the authorities. I am hoping that the paladin will not agree. He’s a new player and maybe not 100% clear yet on what it means to be lawful good at all times. Then, some of them are ready to rush to Thistletop already as well. At level 2, this would be a very short trip. I am hoping that they will take the time to digest the information they got from Tsuto’s journal and will maybe try to investigate the catacombs first, especially as they received information that there’s a quasit underneath Sandpoint, and our paladin managed his knowledge religion check so he knows it’s a demonic creature. I’ll have to be prepared that they will want to run off in every which direction. This session was fairly low on roleplay, high on combat, and so I am hoping that next time they will take the time to talk to some NPCs in Sandpoint to learn more. I will have to continue working on better encounters. I am considering buying Green Ronin’s Advanced Bestiary for access to the templates, and Rite Publishing has templates as well. Anything to make those encounters more challenging. I am also thinking about switching to the medium advancement track after the next level, because some of the characters are more than halfway to level 3. Our rogue keeps missing sessions though, 2 out of 4 so far, and so he is still at level 1. It was good fun again, and I really wish we had more time to play than just once a month. I am eager to get through Burnt Offerings. The Skinsaw Massacre seems like such a fantastic adventure, I can’t wait. 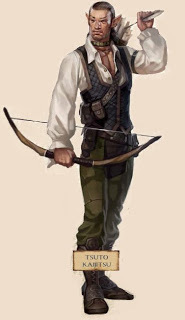 I am really hooked on GMing those great APs Paizo has published and am pondering if I have time to sort out a PBEM group or a forum game. I offered to run a solo campaign for my SO, and she wasn’t interested at all, because she likes the social interactions best. She’s got a point, doesn’t she? I seriously haven’t looked into virtual ways to RP yet, but I am also looking something relatively low on time commitment, as I already have two different games a month now. But the addiction, it is strong, at the moment.